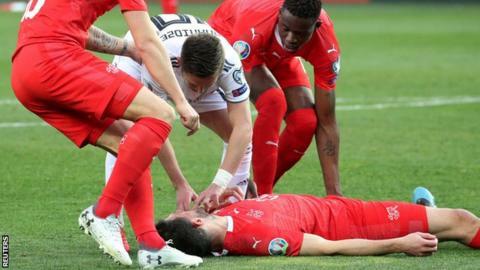 Schar collided with Georgia's Jemal Tabidze and received emergency help. Headway chief executive Peter McCabe said: "What is it going to take to make football take concussion seriously?" The 27-year-old recovered quickly after further treatment from Swiss first-aiders, Swiss newspaper Blick reported, and was able to continue playing, helping set up Switzerland's second-half goals for their 2-0 victory. "It looks awful. I can't remember anything," the Newcastle player told Blick after being shown video footage. Tabidze also lay motionless after the clash, his shirt covered in blood, but he, too, recovered and continued playing with a bandage around his head before coming off just after the hour mark. McCabe said: "How many more players will have their careers and, more importantly, their lives and long-term health put at risk by the sport's inability to follow its own protocols? The Swiss FA confirmed on Monday that Schar will not play in Tuesday's Group D game with Denmark in Basel. It is understood the medical departments of Newcastle and Switzerland made a joint decision to withdraw Schar from the Denmark game.